Periodic evaluation of monitoring programs is important to accommodate changing objectives, technological advances, and the accumulation of information over time. Uncertainty analysis can provide a basis for making difficult decisions about reducing or redirecting sampling effort, as will be illustrated in case studies involving mercury contamination in fish and loons, measurement uncertainty in forest inventory (FIA), and the number and placement of precipitation gauges at Hubbard Brook. Please come to learn about and discuss what analyses to use in which circumstances and how they might be applied at your site. Quantifying uncertainties and merging observations, experiments, and models for improving estimation, mapping and forcasting of terrestrial ecosystem dynamics I and II. Quantifying uncertainty in studies of forests is important to establish the significance of findings, make predictions with known confidence, and guide investments in research and monitoring. This symposium will address sources of uncertainty in estimates of carbon and nutrients in forest soils, above- and belowground biomass, and ecosystem inputs and outputs. Presentations will address sources of uncertainty in forest ecosystem studies, including natural spatial and temporal variation, measurement error, model uncertainty, and model selection error. Examples include the importance of spatial variation in detecting change over time in soil stores and measurement error in forest inventory due to identifying or classifying trees, measuring them, and determining whether trees are live or dead and in or out of a plot. Model uncertainty within and across models is important in biomass estimation and climate predictions. Presentations will also address how these uncertainties influence monitoring designs or affect management and policy decisions. A Survey of Current Practices in Uncertainty Analysis in Ecosystem Ecology. How to Avoid Errors in Your Error Analyses and Gain Confidence in Your Confidence Intervals. Regional Scale Uncertainty Estimates from Fine-Scale Forest Inventory: Stored and Accumulated Forest Carbon in the Eastern US. Carbon Cycling of Forest Ecosystems As a Fuzzy System: An Attempt to Assess Uncertainties. Airborne Laser Scanning-Assisted Sampling for Remote Regions. The International LTER Network held its first global Open Science Meeting. QUEST collaborators organized an "Estimating Uncertainty in Measurements, Experiments, and Models Workshop." UFRO World Congress: Sustaining Forests, Sustaining People, The Role of Research October 5-11, 2014 Salt Lake City, Utah, USA. Presenters from four different countries described sources of uncertainty in estimates of forest carbon and nutrient pools and fluxes, including natural spatial and temporal variation, measurement error, model uncertainty, and model selection, and addressed how these uncertainties can guide monitoring designs and affect management and policy decisions. Technical Sessions #58A & B: Quantifying Uncertainty in Forest Measurements and Models: Approaches and Applications. Presentations shared approaches to analyzing uncertainty in forest measurements and giving examples of applications of uncertainty in above- and belowground estimates of forest biomass, carbon, and nutrient pools and fluxes, as well as other ecosystem attributes. Although methods are well established for statistical analysis of most experimental designs, there are fields in Ecology where it is more difficult to establish confidence in results (e.g., in catchment studies, treatments are rarely replicated). For environmental networks, using standardized approaches ensures that results are comparable, but sometimes the same statistical technique is not applicable to comparable data sets (e.g. when there are significant differences in the sample size of the same population at two geographically distinct locations). Many of these concerns can be addressed through the appropriate use of tools for uncertainty analysis. This workshop will highlight current developments in uncertainty estimation across many fields of ecology. Overview presentations will focus on practical examples of how uncertainty calculations can inform data over small-to-large scales. Data packages and software tools will be shared with the attendees. Participants are encouraged to bring their own data sets and laptop computers; we will provide data for the exercises if you don’t bring your own. We welcome participation by researchers in all career stages and from a broad array of ecological disciplines. Quantifying Uncertainty in Biogeochemical Studies I session. Oral presentations by Brent Aulenbach, John Campbell, Josh Roberti, and Ruth Yanai. Ruth Yanai, Jeffrey Taylor and Mark Harmon organized, and John Battles moderated an "Organized Oral Session" on Uncertainty Analysis: A Critical Step in Ecological Synthesis at the 2013 Ecological Society of America Annual Meeting in Minneapolis, MN. Ecology is entering an exciting era in which the number and availability of long-term data sets are increasing exponentially. There is an unprecedented need to synthesize these data to address current scientific and societal problems. Great progress has been made on linking data and theory, including spatial integration and interdisciplinary combination. The question is no longer how to synthesize, but how well we link information from disparate sources and how to identify the most important areas for improvement. These synthetic approaches will demand increased proficiency and rigor in uncertainty analysis, to provide a metric of progress in synthesis science. This OOS highlights current developments in uncertainty estimation across many fields of ecology and provided guidance for large-scale synthesis research. Speakers were encouraged to provide recommendations for standardized approaches to uncertainty estimation and a vision for meeting future needs. Further development, understanding, and dissemination of the latest statistical techniques for deriving these estimates both inform ecological sampling design and equip up-and-coming ecologists with critical skills. Speakers examined sources of uncertainty and its general role in synthesis science. Case studies included a range of topics and approaches ranging from population ecology and small watershed nutrient cycling budgets to landscape carbon budgets. Methodologies presented include parametric statistical approaches, bootstrap analysis, Monte Carlo sampling, and Bayesian hierarchical analysis. Uncertainty introduced by spatial and temporal interpolation are common themes across scales from plots to the continental ecological observatory network. This preceded the first Quantifying Uncertainty in Ecosystem Studies meeting in Boston, March 14-15 2011. 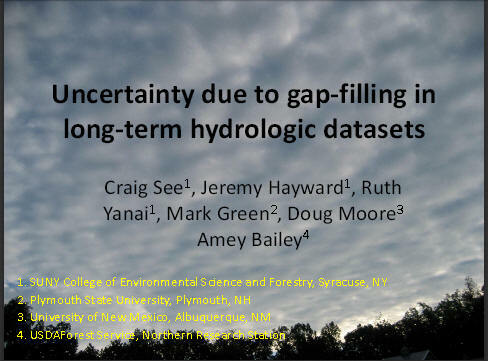 The webinar and meeting were the first phases of our Long Term Ecological Research Network Office Synthesis Working Group (LTER SWG)'s evaluation of uncertainty in hydrologic inputs, outputs, and net hydrologic flux of major elements across small watersheds with diverse characteristics. History of Quest: Ruth Yanai explains what we do, why it's important, and how it came to be. Sources of Uncertainty: Mark Harmon sums up where present knowledge is lacking. View the whole 2h mwv.